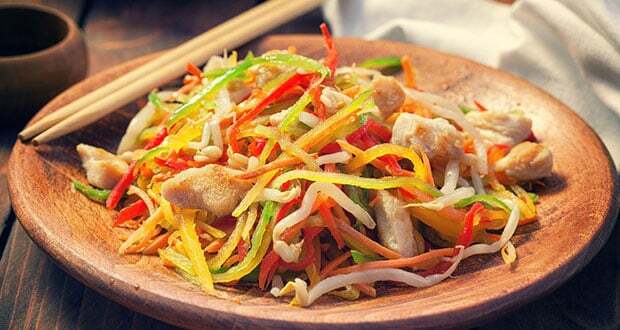 A delicious Thai salad, Som Tam is a green papaya salad that combines all four tastes - sour, chilli, sweet and salty. A healthy and tasty treat for brunch, lunch or a casual light dinner. 1.Peel and seed papaya and shred it. Put in a bowl. 2.Crush garlic with a pestle, then add long beans and tomatoes and pound a few times to release juices. 3.Add the chillies and crush lightly to release the heat. 4.In a separate cup dissolve the sugar in the lime juice and fish sauce. 5.Mix all ingredients together now and toss to mix. 6.Serve in a shallow bowl and top with garnish. 8.Do not blend but use mortar and pestle for the salad. 9.Do not add salt, the fish sauce or soy sauce has enough salt. 10.Taste once mixed and add any ingredient to taste ..this one is supposed to be deadly spicy.